My Sketchbook is in a Moving Box! I’ve been asked whether I gave up blogging. One might even wonder whether I gave up sewing. Perish the thought! Since my last post, I’ve found a new apartment, moved in and have been dealing with the fact that work hasn’t let up for a minute. And other stuff. I’ve finally gotten to the point where I can unpack my sewing supplies, take my machine out of its box (which I kept after I bought it a year ago because I knew I wanted to move), retrieve my serger from my dear friend Stephanie King’s living room and organize my fabric collection. 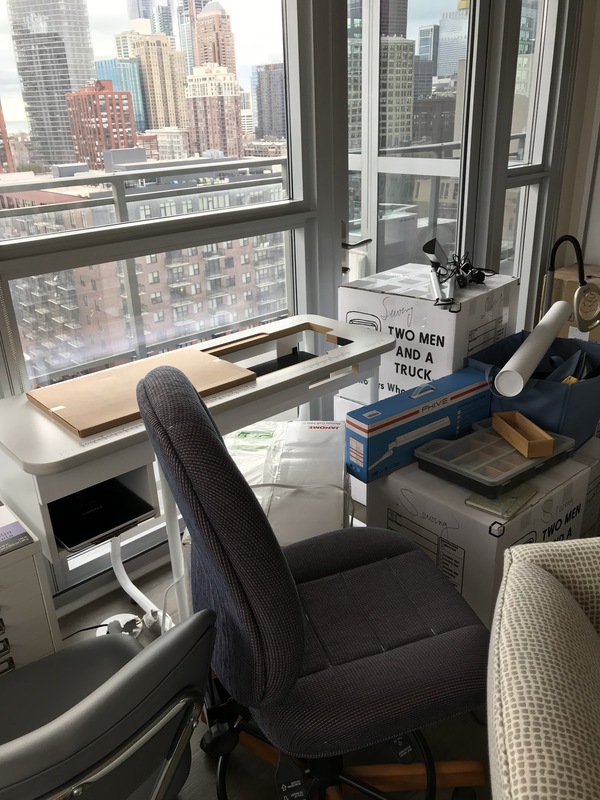 I’ve been in the new place for just under three weeks and whenever I find myself getting frustrated with the pace of the unpacking I remind myself that not only did I move my home, but I also moved my office and my sewing studio and they are all in the same place. Then there’s the whole organization project. I made lots of changes with this move and I’m about as obsessive about organizing stuff as I am about sewing, so I’ve made A LOT of trips to The Container Store. I promise to finish a post on my latest project in a few days. Until then, enjoy whatever fabulous creations the lovely and talented Stephanie King of Siouxzeegirl Designs has to share. I spent the first week of this month in Baltimore, most of the time in Sarah Veblen’s class, “Exploring Fashion Design – Design II.” So I thought I’d show you some of the sketches I made in class. This collar is from an inspiration picture from the ’50s. I’ve decided to use it for another version of my two-piece dress and I think this lightweight wool from A Fabric Place would be perfect for it. Even though I’m not really in the mood to think about winter coats right now, I think I’ve finally found a collar that works. This neckline detail was based on something I saw in one of Sarah’s designer books – of course it was Dior! I’m thinking about what direction to take this in, but I really like it. I decided I’d like to experiment with some detail in my sheath dress. I like the idea of channel stitching, inset pieces, maybe pin tucks. Sarah got me started when I told her what I had in mind but felt stuck and I took it from there. Now I need to sew up some samples. And this is a dress I sketched after I got home. I want to use this fabulous fabric combination. The sage green wool crepe is a gift from my dear friend Steph King and the charmeuse is from A Fabric Place. I was sure it would be no problem to have this dress ready in time for the Haute Couture Club of Chicago fashion show luncheon, but then the days on the calendar disappeared and now that luncheon is only a week away. Yikes! Be sure to check out what fabulous designs my dear friend Stephanie King of Siouxzeegirl Designs is showing at 10 Sewing Machines & a Serger. We’d love to see and hear about what you’re sketching, so please leave a comment. It has been almost two years since I attended Sarah Veblen’s Class Exploring Fashion Design: Design 1. That was what inspired our In the Sketchbook series. We are getting ready to participate in Sarah’s Design 2 class next week and I’m excited to see what new ideas come out of that experience. This month, I’ve been thinking about skirts. Mostly because I’m once again mired in a seemingly endless series of pants mock-ups and skirts are something I consider to be manageable. The other reason is that our ASG Neighborhood Group, Sew Chicago, is doing a skirt challenge for the October 2018 ASG Chicago Fashion Show. The rule is that the skirt has to incorporate two elements we covered in meeting presentations in 2017 and 2018. Not all of the skirts I want to try meet those criteria, but there are some that have possibilities. One of the elements we can use in the challenge is bias. Some of you may remember that my attempt at an all-bias skirt did not work out. I saw a picture of a Vogue skirt pattern a few months back that got me to thinking that something like this might work if the fitted part on the top is on the straight of grain and the bottom part is on the bias. That might also work if the bottom part were a sheer fabric, which would qualify for the two elements for the challenge. Edge trim is another element that would qualify for the challenged I could add that to the diagonal seam between the two parts of the skirt. Another possibility would be to make the entire skirt out of a sheer fabric. A technique we looked at in a meeting involved finishing a hem with ribbon or trim. The ribbon is attached to the wrong side of the garment, then folded to the right side and attached at the top, encasing the cut edge in between. It’s a nice finish and it also adds some weight to a sheer garment, which would help it hang nicely. With the pants conundrum fresh in my mind, I’ve been thinking about casual skirts that don’t have anything to do with the skirt challenge. Here is my take on a skirt with a single pleat on either side of the center front panel. The variation on the right has reinforcement for the pleat in a decorative stitch. (I’m sure there’s a name for that, but I didn’t look it up.) I see this in a khaki twill that’s easy to wear in the spring and summer. From there, I thought about this variation. It has two little pleated godets and buttons at the the juncture that are both decorative and functional for reinforcing that critical area. I think I could have some fun with this one. And I can’t think about skirts without going back to the trumpet skirt that has been in my head forever but only has the beginnings of the pattern drafted. And I’d like to try a skirt with pleats just at the hem, either from the fashion fabric or pleated ribbon. Another use for ribbon peeking out of seams is to use them all the way up each princess seam to embellish a pencil skirt. This last pair of sketches aren’t skirts, but the idea struck me as I was looking for something in my fabric collection and my eyes landed on the fabulous black ostrich feather boa I bought at Haberman’s Fabrics. It occurred to me that I could use those feathers to trim a Little Black Dress for next year’s opera season and whatever other occasions I might have. I could either use the feathers just at the hem or at both the hem and the neckline. Here are a front and back view. I started off the year promising myself I would sew wardrobe-building pieces from patterns I’ve already developed. For some variety, I’d change one or two design details and not attempt any quantum leaps. So in January I took a fabulous cotton tweed (yes, cotton tweed!) fabric that I bought from Sawyer Brook a few years ago and a dress pattern I’ve used before. It’s the pattern I developed for my ASG Neighborhood Group’s Spoonflower fabric challenge. I also used the pattern for last year’s bias challenge. Those two dresses are sleeveless and the first one has a collar, so the only changes I made to this dress were to add ¾ length sleeves and omit the collar. I planned to make it an easy, casual dress with no lining. What could go wrong? Two months, later, I can give you an answer to that question. This fabric raveled so much the serging fell off in places and threatened to fall off everywhere else. And, the problem might not have been quite so bad if it weren’t for the fact that I use ⅜” seam allowances. The lesson for future projects: test the fabric before cutting and if it looks like raveling might be a problem, add wider seam allowances to the pattern and clean finish all edges immediately after cutting the pattern pieces. So, what to do for this dress? (Besides abandon it, which I seriously considered doing, along with abandoning sewing altogether and taking photography lessons.) I turned to fusible bias tape to literally glue the cut edges. I then serged and, in some places, serged for a second time. Then I decided that the seam allowances might hold up through a few more wearings if I cut down on the friction by installing a lining. So, I cut Bemberg Ambiance and my quick and easy dress became a bigger deal than I had anticipated. I also had to deal with the fact that the worst fraying was in the Empire seam in the back, which meant that my hemline was way off. I’d lost so much length in the back that I had to opt for a hem faced with stretch lace and trimmed the excess in the front and at the sides. The overall length is ¾” shorter than I usually wear my skirts and dresses, but I figured with opaque tights it would be fine. I really like the shape of the dress and the the way the fabric looks and feels when I’m wearing it. I’m glad I finished it. I’m just hoping my next project is less of a challenge. Both my Spoonflower dress and my bias challenge dress are sleeveless, so an extra layer to extend them into 3-season wear is nice to have. I filled this wish list item with a black rayon knit cardi that follows the curve of the Empire seam on the dress. For the pattern, I used my no-closure topper. I thought I would use the pattern I had made for the white piqué jacket as a guide for the hemline, but I quickly learned that translating the princess seams pieces to a pattern that gets its shaping from pleats and darts is not a straightforward process. Then again, it wasn’t rocket science either. A little draping on my dress form got the job done. As I said, the pattern uses pleats at the shoulders, along with darts for shaping. It also has pleats at center back where I rotated out the princess seams. So, getting pleats into the knit was my first construction challenge. It occurred to me that I could hold the shoulder pleats in place and stabilize the shoulder seam in one fell swoop if I used fusible stay tape. (What did we do before all these fabulous fusible products came on the market?) My favorite brand is Design Plus. I used the straight version for the shoulder seams, then sewed the seams together. This had the added benefit of stabilizing the shoulder seams, which I probably should do all the time in knits but don’t. For the pleats in the center back at the neck, I used the bias version of the same product. I used this project as an opportunity to get comfortable with the cover hem function of my new-to-me Babylock Evolution. I practiced on multiple samples, following tips from Gail Yellen’s Craftsy Class and Pamela Leggett’s Threads video and book. I snipped the seam allowance at the point where the hem would turn under so I could have the hem allowance seam allowance face the opposite way from the garment seam allowance, thus reducing the number of layers the machine had to deal with when it crossed a seam. It also made the finished product look and feel nice and flat. To stabilize the hem, I used Ultra Soft fusible web at the cut edge, first pressing what Gail Yellen calls a “memory crease” with the backing paper still on. The curves required lots of snips, pins and patience as I worked my way around the entire periphery of the garment. The next steps were to remove the paper backing, pin where needed and press to glue the layers together. This ensured that I wouldn’t get any fabric creeping and bunching or twisting as I sewed the cover hem. I’m glad I prepped multiple samples for the coverstitching because I found that things went great on the first sample and the left needle came unthreaded on the second. After rethreading the machine a few times and having the same issue, I found a more detailed threading diagram in the machine manual and discovered that I was missing one piece of the needle thread path. Problem solved. Except that wasn’t my only problem. I made what all the serger teachers say is the most common mistake made on serger/coverstitch machines multiple times, which is stitching when the presser foot is in the up position. I kept forgetting that lifting up the presser foot to its highest position so I could position the fabric under the needles and then letting go still leaves it in the up position. The lever has to be lowered to get the foot all the way down. I got to the point where I said out loud “remember to put the presser foot all the way down” whenever I had to start a new line of stitching. My cat didn’t get annoyed and I got the job done on the entire body of the garment as well as the two sleeve hems. So, now I’m not intimidated by the coverstitch function of my serger, plus I have a nice new layering piece to wear.